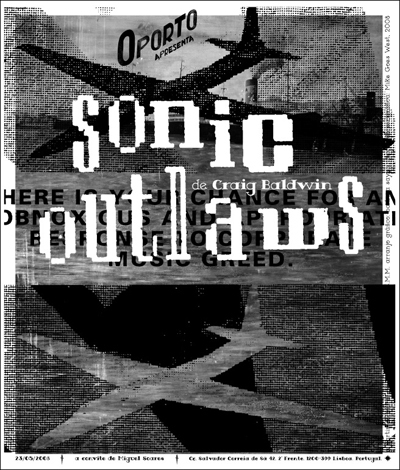 Counterpath – Craig Baldwin’s SONIC OUTLAWS, Wednesday, April 25, 2012, 7 p.m.
On April 25th, 7 p.m., collage-film essayist and west coast underground film legend Craig Baldwin came to Denver for a screening at Counterpath of his 1995 documentary, Sonic Outlaws. One of Senses Of Cinema’s “great directors,” Craig Baldwin is a recombinatory filmmaker who exists at the edge of contemporary cinema both through his films and his weekly film series, Other Cinema. The spread of his films in the last two decades, particularly *Tribulation 99*, *Sonic Outlaws* and *Spectres of the Spectrum*, introduced archival retrieval and culture jamming to a wider audience of cineastes who embrace, implement and teach these practices. He uses “found” footage from the fringes of popular consciousness as well as images from the mass media to undermine and transform the traditional documentary, infusing it with the energy of high-speed montage and a provocative commentary that targets subjects from intellectual property rights to rampant consumerism. Baldwin has made a career out of digging up and appropriating the forgotten and preposterous corners of American popular culture; everything from monster movies and educational films to conspiracy theories and secret historical figures have been given new life by Baldwin’s swirling phantasmagoric amalgamations. He’s also recieved notoriety for his 1995 documentary Sonic Outlaws, which detailed the legal battles that the band Negativland faced with their U2 parody, kicking off an ongoing and unresolved discussion over copyright issues and creators’ rights in new media culture. In 2003 Baldwin created the Other Cinema Digital label which highlights and distributes films from his 25+ years of microcinema programming. Under Baldwin’s leadership Other Cinema remains the long-standing bastion of alternative film, video and performance in San Francisco’s Mission District.